EDUCATION Minister Katrina Hanse-Himarwa today told the Windhoek high court that she had no mandate to scrutinise the mass housing list. 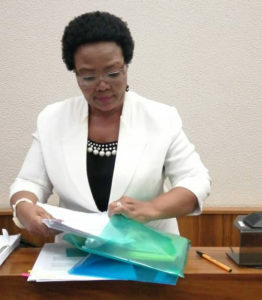 Hanse-Himarwa, who is facing corruption charges emanating from the time that she was governor of the Hardap Region, confidently told the court that it was up to the administrative office to investigate these issues. When rumours surfaced that she was involved in the irregularities, Hanse-Himarwa said she had ‘no time’ to investigate baseless gossip. “I could not occupy myself with things that were not in my mandate,” she said. Deputy Prosecutor General Ed Marondedze then put it to her that she took a conscious decision as a leader not to look into the allegations because she willingly edited the beneficiary list and had full knowledge of the action. “Your silence when Daniel Nghidinwa, the Permanent Secretary of the Ministry of Urban and Rural Development, testified in this court shows that you indeed agree that there was a tampering of the list,” Marondedze argued. 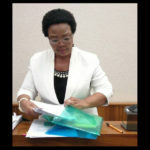 Hanse-Himarwa stated that she was shocked when she read the witness statements. “I must say, I was looking for reasons as to why they would do this. I was especially shocked because the Mariental Town Council CEO, Paul Ngiwilepo, is a long time friend, someone close to me and a business associate. Where I stand now, the only conclusion after I’ve read the statements is that there is definitely a connivance that was engineered and manufactured by the ACC,” Hanse-Himarwa said. The State continued to grill the minister, who has enjoyed, since the start of her trial, a strong support base in the court’s galley that consists mainly of politicians and family. The state will wrap up its cross-examination tomorrow morning. The defense will possibly then call forward witnesses to testify in favour of the minister. If not, final submissions will be given before judgement is made on whether or not Hanse-Himarwa is guilty on the charges of gratification.